"The extra boost from NCCS removed some of the extra weight on our shoulders,: said Elizabeth. "Thank you NCCS!" 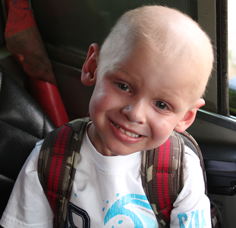 Drew was diagnosed with cancer in the summer of 2012 just months before his third birthday. His parents noticed he was walking strangely and immediately took him to the doctor. Tests revealed an abdominal mass that was wrapped around his spinal cord. Drew underwent surgery, a stem cell transplant, chemotherapy treatments and radiation to make him well. He spent nearly 100 nights in the hospital over the past 15 months. As Drew's mom Elizabeth said, "We didn't realize how deeply our finances were going to be affected. Very quickly we learned that multiple trips to two hospitals each week, eating three meals a day in the hospital cafeteria for days on end and other costs associated with his treatment combined with me being unable to work was going to devastate our finances." Thanks to supporters like you, the NCCS was able to help Drew and his family get the treatment he needed to beat his disease. "The extra boost from NCCS removed some of the extra weight on our shoulders," said Elizabeth. "Thank you NCCS!"